And for good reason. His small band -- 2 guitars, bass and drums -- put out a big, bluesy sound. Bryan's other guitar player is extremely talented! If you haven't seen "Festival Express" ... TiVo it, rent it, or buy it. A very young Buddy Guy is one of several acts (also The Grateful Dead, Sha-Na-Na, The Band, and Janis Joplin, to name a few) traveling by train to several music festivals across Canada. The footage shot at the time (late 60's) was lost until a couple of years ago -- they've interspersed interviews with many of the performers (now 30+ years older) and shots of the most gorgeous scenery shot from the train traveling across Canada, and this is a movie all music lovers should see! 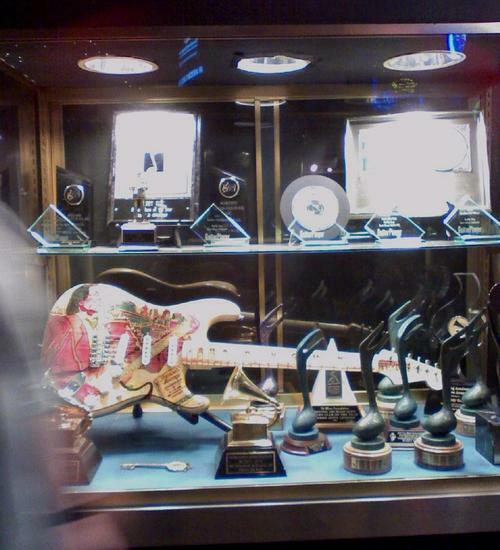 The walls of "Legends" are covered with autographed guitars, Guy's awards, photos and paintings of other music legends. Here's a display case full of Buddy's awards -- I see a couple of Grammys, several WC Handy Blues awards, and so on and so on. We had to stop to buy t-shirts on the way out -- I'm now proudly wearing my black Legends t-shirt stamped in BLUE (what else?) ... "Buddy Girl." Today (July 30th) is Buddy Guy's 71st birthday. HAPPY BIRTHDAY, BUDDY! Lesley, another great review where I felt I was right there with you, standing in that crowded, smokey club listening to the Blues. Love the second picture! Wow Lesley!! I get more and more jealous of you with these reviews. I LOVE BLUES and I would have loved to see this show! Sounds really awesome!! Great review ! After reading your description, I want to make a trip to Chicago ! Looking forward to reading more of your reviews. Thanks for the tip on the video.. haven't seen it. 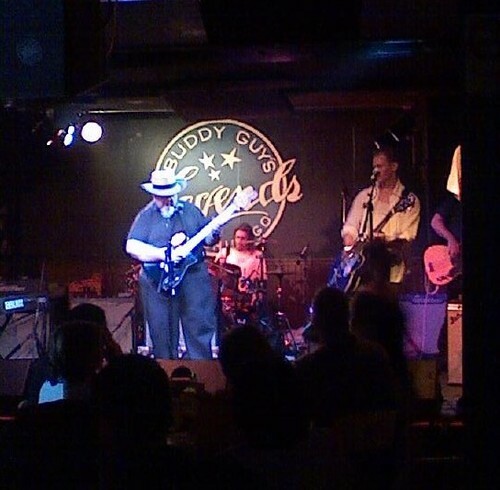 Chicago Blues Clubs are so real... 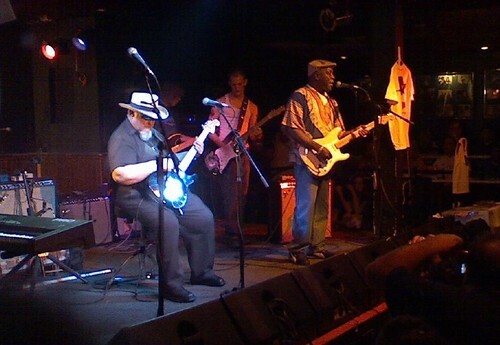 Buddy Guy in a Chicago Blues club.. UNREAL. Good for you. You rock sister. Fantastic account of a great event complete with amazing pictures! Thanks for sharing! Hi, I must admit that this blog is really nice. Though the para 1 is introductory, the most beautiful thing I liked about it is the conclusion part. You have concluded in an unbiased way presenting the facts.